Linear Regression is a basic option of Advanced Analytics. I once wrote about achieving the regression line in OBIEE using the Oracle DB capabilities at "OBIEE and Linear Regression with Oracle DB". 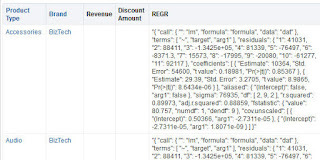 Oracle documentation describes the REGR function: The REGR function fits a linear model and returns the fitted values or model. You can use this function to fit a linear curve on two measures. So we have a "fitted" regression of Revenue vs. Discount Amount, where each point is combination of Product Type and Brand. 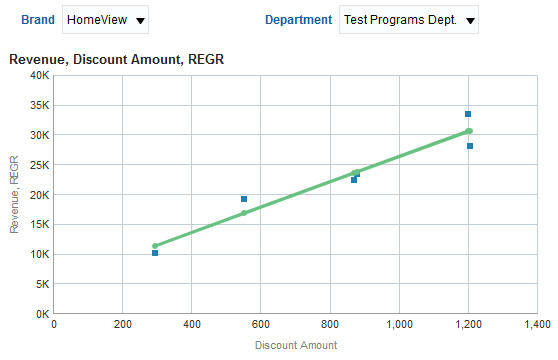 y_axis_measure_expr indicates the measure for which the regression model is to be computed. 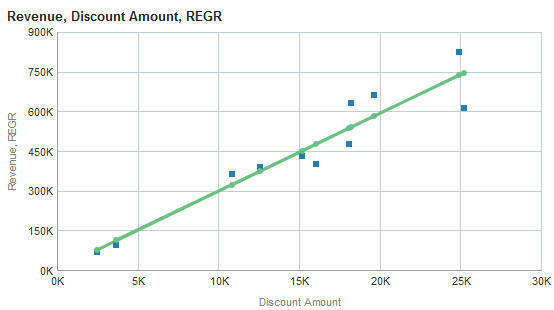 x_axis_measure_expr indicates the measure used to determine the regression model for the y_axis_measure_expr. category_expr1, ..., category_exprN indicates the dimension/dimension attributes used to determine the category for which the regression model for the y_axis_measure_expr is computed. One or up to five dimensions/dimension attributes can be provided as category columns. output_column_name indicates the output column name for regression. Valid values are 'fitted', 'intercept', or 'modelDescription'. modelDescription - the Model in JSON format. options indicates a string list of name/value pairs separated by a semi-colon (;). The value can include %1 ... %N, which can be specified using runtime_binded_options. runtime_binded_options indicates an optional comma-separated (,) list of runtime binded columns or literal expressions. From my personal testing, All the options in the documentation (algorithm, targetNames, showModelDescription) seems irrelevant at the moment. Mostly because they have only 1 relevant default value. It seems that adding the intercept or modelDescription output to the analysis hides the measures. 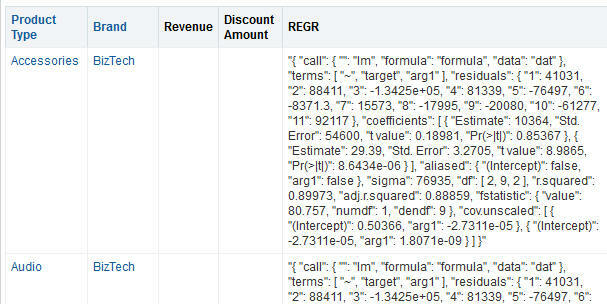 Usually we can add extra columns that are not in the REGR function to the analysis. For example, similar to previous function, where I replaced Brand with Product and added the Department (from another dimension) to analysis.